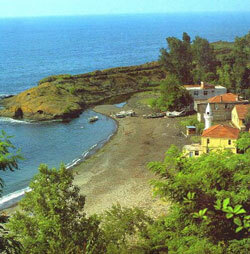 The prosperous Black Sea region is mostly made up of steep and rocky coastal areas. Though there are also some broad and elevated basins in the inland section, the population is concentrated along the coastline, where traditional economic activities thrive. The climate here is damp and cool. The Black Sea region’s rustic communities are focused on fishing and agriculture, though instead of wheat and barley, they grown corn in the coastal areas and rice, beans, sugar beats, nuts, potatoes, onions, tea, and hemp in the plains. In the eastern sections of the region, particularly the provinces of Ordu and Giresun, hazelnut trees cover the land. In general, the area is heavily forested and there are more than 7,000 plant species growing in the thick inland forests. The western section of the Black Sea region is a heavily industrial area. The provinces of Karabük and Ereğli have many iron steel facilities and there are many coal regions in and around Zonguldak. Other industrial structures in the area are food processing plants, the Çatalağzi Thermal Power Plant and the Murgul Copper Production Facility. The province of Ordu lies at the foot of a hill on the Black Sea coast. It has a beautiful landscape of lush forests, rivers, and vegetable and fruit gardens. Its rainy climate favours hazelnuts, for which the province is most famous. Ordu produces over 50% of Turkey’s supply of the nut. The province’s seaside capital, Ordu, even hosts the yearly Golden Hazelnut Festival. Ordu is a popular holiday getaway for many Turks and tourists from Georgia and Russia. They come to stay at villages like the hilltop Boztepe, which has amazing views of the city and the sea. A Hilton hotel is being planned in the area. Bolu, in the western Black Sea region, is one of Turkey’s most alluring provinces, with verdant mountains, lush forests, broad pastures, and scenic lakes. Its rich flora accounts for more than half of Turkey’s 7,000 plant species. Bolu’s most attractive feature is Lake Abant, surrounded by thick pine forests. During summer, the nature park is an ideal spot for picnics, horseback riding, camping and fishing. In the winter, it becomes a popular ski centre. The town of Göynük, part of an ancient trade route, has traditional Turkish houses and the 15th century Aksemsettin Tomb, a fine work of art of the Ottoman period. The 14th century Yıldırım Beyazit Mosque in nearby Mudurnu features magnificent interiors. Other popular attractions in the province are the Monday markets in the city of Bolu, the cuisine and cooking competitions in food-loving Mengen, the Yedigöller National Park with its seven lakes, the excellent Kartalkaya Ski Resort, and the Karacasu Thermal Springs, which have been in use since the Ottoman period. The small province of Bartın has some of the loveliest beaches along the Black Sea, and is becoming increasingly popular with tourists. Its capital city of Bartın, situated on the Bartın River, is famous for old wooden mansions that can no longer be found anywhere else. Though the province is new, the city dates back to 1200 BC. Ancient ruins can be found in the popular beach town of Amasra and the fishing villages of Kurucaşıle and Çakraz. The holiday village of İnkum has sandy beaches and nice tourist facilities. Amasra is a small port town on a peninsula in Bartın. Founded in the 6th century BC, it occupies one of the loveliest spots on the Black Sea. Today, it is a much-loved holiday beach resort. The town consists of one big island, the highly touristic Büyük ada, and a smaller island, Tavşan adası, which has a fishing village. In Büyük ada there are old Ottoman and Victorian houses alongside modern buildings housing shops, cafés, and restaurants. A notable attraction here is the Kuskayasi or Bird’s Rock Road Monument, a path through the forest that was built between 41 and 54 AD.